Wanna get out of Jersey and enjoy some winter fun? Check out some of the best ski resorts in Upstate New York, located within a short drive from New Jersey, and plan a short ski getaway! Megan Gates is an active blogger who provides written work to the blogosphere pertaining to NYC Rentals, Hamptons Real Estate, home improvement and the latest architecture, design, fashion and travel. Follow her on twitter @MEGatesDesign. When thinking about fun outdoor activities and vacations, we often think about spring or summertime with warm weather conditions, when in fact colder weather can also provide opportunities for wintertime fun. This includes skiing, snowboarding and other activities. With so many wonderful skiing opportunities in New York state, whether your family is extremely skilled on the slopes or you have never skied a day in your life, these top 5 ski resorts can give you exactly the experience you are looking for. Whiteface Ski Resort: Located in the Adirondack Mountains on Lake Placid and home to the 1980 Olympics, Whiteface Mountain is a never-to-be-forgotten experience. Not only is it the highest ski mountain in the east, with the greatest vertical drop, but it has 86 runs, 11 lifts and excellent terrain parks for skiing and snowboarding. 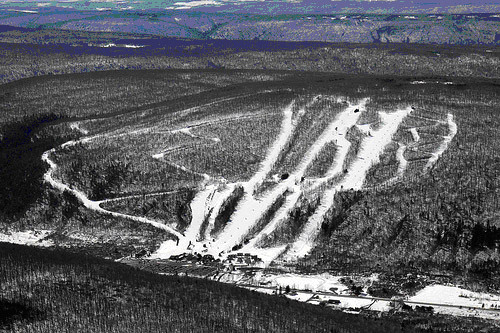 Whiteface hosts many international events for expert skiers, yet opportunities are offered for beginning skiers as well. In addition, the Olympic center houses the Olympic museum and an arena for public skating and other events. There are 6 mountainside restaurants for added enjoyment at the end of a long day on the slopes. Mohonk Mountain House: This beautiful Victorian castle ski resort, which is located a short 90 minutes from Manhattan in New Paltz, offers many activities for the entire family including cross country skiing with over 30 miles of trails. For those who like variety, snowshoeing and snowboarding are also available, plus an indoor ice skating pavilion which offers 9,375 square feet of fun featuring a 39 foot tall fireplace. Mohonk Mountain House also offers free use of all equipment needed for various activities to overnight guests. This resort in Canandaigua has been renovated in the last several years and has not only expanded the trails but has added two new terrain parks, high speed chair lifts, improved snow-making and state-of-the-art grooming. Each of the three terrain parks is designed with a different level of skill in mind, offering a fun experience for novice skiers as well as those who are advanced. This great resort with a quaint village and 1600 feet of vertical skiing offers the largest amount of snow-making acreage within 200 miles of New York City. The fully equipped lodge includes great food and beverage, equipment rental and a locker room to store all your gear. An outdoor barbecue and fire pit adds to the uniqueness of this outstanding resort. 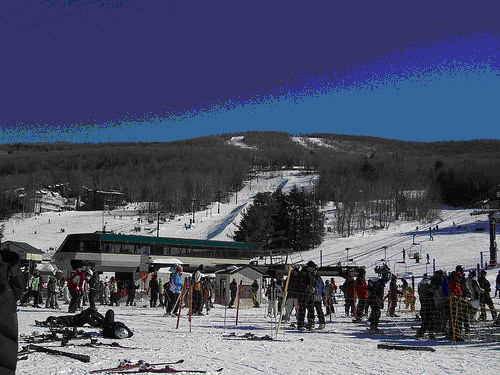 In addition, there is an outdoor skating rink, a tubing park and night skiing. A children’s learning center and junior ski lessons make this a family-friendly resort. Hotel Thayer at West Point: Skiing is a 60 year tradition at West Point and for those who have been affiliated with the U.S. military or guests of military members, this ski resort is a great value with excellent amenities. Hotel Thayer offers 3 intermediate trails and a bunny slope for those who are just beginning. Ski lessons are available for children and adults of all skill levels and the mountain is patrolled by 40 National Ski Patrol certified volunteers, keeping safety as a priority. A terrain park is also included for all levels of skiing and snowboarding. Snow-making capabilities around the clock insure that there will always be enough snow. The ski lodge offers homemade pizza, soup, sandwiches, salads and hot chocolate. Of course cross-country skiing is also available when there is enough natural snow. With perfect conditions for skiing, there are too many beautiful ski resorts in New York to mention, but now you know 5 of the most outstanding. When traveling to New York in the winter months, be sure to make at least one of these your destination so you can experience snow skiing at its finest!